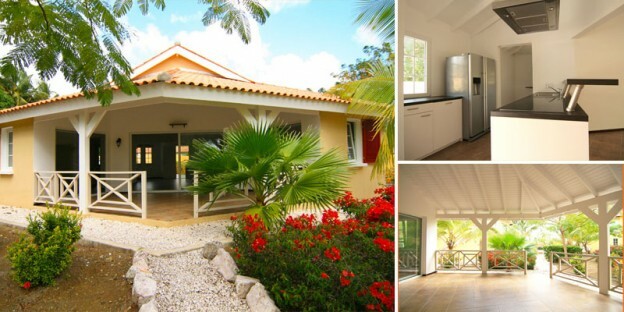 Luxurious and spacious bungalows for sale in Residencia Tropicana. A lovely place to peacefully enjoy the ever so coveted island lifestyle. 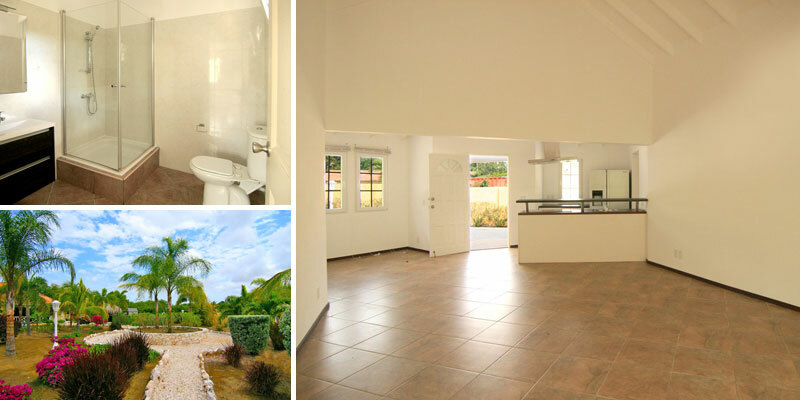 A bungalow at Residencia Tropicana measures an approximate 130m2 of living space. The front entrance immediately leads into a luxurious semi open plan kitchen including a breakfast bar, an American style double door fridge, microwave/oven combination and a dishwasher. Adjacent a scullery annex storage room with connections for a washer and dryer. The bright and spacious living offers ample space for a dining and lounging area. Glass sliding doors open up to a generous sized roofed porch and into a private garden with palapa. A full master suite with en-suite bathroom and walk-in closet is situated at the side of the kitchen. At the other side of the living, two more good sized bedrooms are situated. These share a second bathroom. Needless to say that all bedrooms are air conditioned. Plenty of outlets for both 110V and 220V appliances are available. All rooms are prewired for TDS television, phone and/or internet connections. All windows and sliding doors are of German fabricate, all windows feature tilt & turn functionality. Residents get to use two parking spaces per home. These bungalows are well suited as investment property for long term rent. Demand for quality rentals in desirable neighborhoods like Jan Thiel is high. Please do not hesitate to inquire after homes available for sale and leased for the next few years. Please note: the price mentioned above is an indication and depends, amongst others, upon the location. Monthly resort fees (security, lighting, garden maintenance) amount to approximately Nafl 450. Residencia Tropicana was designed in 2009 by the renowned architect Jean Pierre Agniel and built by project developers Gert and his son Raymond Bongers. The resort is known for its spacious layout, a total of 20 apartments in five traditional Caribbean dwellings and four Tropical style bungalows sit on a lot that measures no less than 10.000m2. Residents get to enjoy gorgeous tropical gardens, including a beautifully landscaped swimming pool, and various shaded terraces without the need to worry about garden or pool maintenance. In order to ensure a peaceful and relaxed environment for all residents at the resort, short term rentals to tourists are not permitted. Investment apartments can only be rented out for long term, the minimal lease term amounts to 12 months. 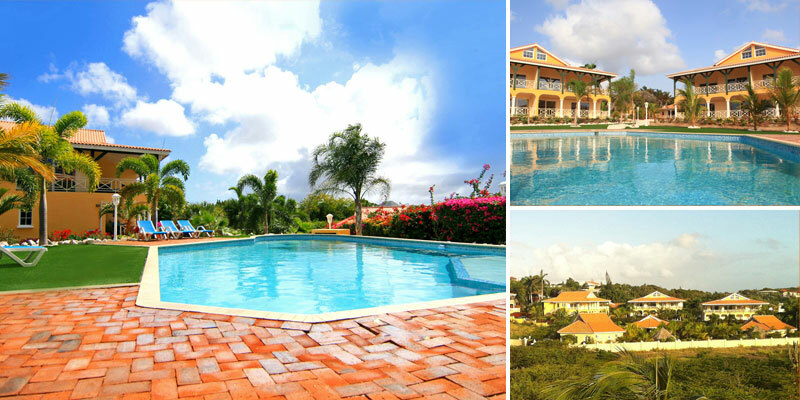 The resort is fully fenced with electronic access and for extra safety on-site security from dusk till dawn. The safety track record for this resort is outstanding. Residents of Residencia Tropicana get the opportunity to rent a private mooring at walking distance. (subject to availability). A short walk brings you from Residencia Tropicana to the cozy beach of Caracasbaai, featuring, amongst others, 2 authentic local restaurants. The renown restaurant De Kleine Wereld is located even closer: just across the Caracasbaaiweg. A two minute drive by car will bring you to the Albert Heijn (Van den Tweel) supermarket and the popular beach clubs Zanzibar, Papagayo and Zest, quaint shops, an ice cream parlor, a casino and The Challenge health club. Expect to find an approximate of 15 restaurants within a 2 minute drive. When you would purchase this home as an investment property, a professional organization specialized in Property Management and known for its services mindedness and quick response times could make this property a virtually effortless investment for you. This entry was posted in Sales on October 9, 2014 by Ray Bongers.